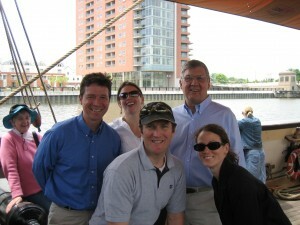 From left to right: Jerry Kauffman, Martha Narvaez, Andrew Homsey, Jerome Lewis, and Julia O’Hanlon on the deck of the Kalmar Nyckel on the Christina River in Wilmington. The mission of the University of Delaware Water Resources Agency is to provide water resources assistance to governments in Delaware, the Delaware Valley, and along the Atlantic Seaboard through the University’s land grant public service, education, and research role. The UD Water Resources Agency is a unit of the Institute for Public Administration within the College of Arts & Sciences. Since 1977, the WRA has been supported by a regional water resources partnership supported by the State of Delaware, New Castle County, City of Newark, and City of Wilmington. During the 1970s, the Water Resources Agency established America’s first GIS laboratory for water resources mapping and analysis.